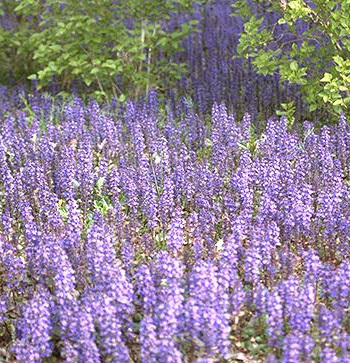 Bugle is a popular perennial groundcover for shady spots; it has a squarish stem, topped in spring and summer with tight whorls of blue flowers. The leaves from the root are stalked, those from the stem, often tinged with blue, are stalkless. After the flowering comes the small, round blackish seeds. The root is composed of many strings, and spreads on the ground. Blooms in May to July. Other varieties: Geneva bugle (A. genevensis) is a taller species with light green, oval, toothed leaves and blue flowers; Bronze ajuga (A. reptans var. atropurpurea) has blue flowers and bronze leaves; A. reptans var. multicolor) with red, brown, and yellow foliage; Red bugle (A. reptans var. rubra) has dark purple foliage with pink flowers; and (A. reptans var. varigata) with leaves splotched and bordered with cream and blue flowers. The white flowered bugle differs by being an evergreen, the leaves and stalks are always green, never brown. Not so plentiful as the common blue flowered plant. Herb-Carpenter is a common plant, which grows in damp woods and meadows. The roots of bugle produces a black dye. One of the mildest narcotics and can be prescribed in all cases. It is a digestive, having a sedative influence on upset stomachs. Used in the treatment of tuberculosis. The bruised leaves may be applied as a poultice for cuts and wounds or bruises. Also made into an ointment. Decoction of leaves and flowers is used for cough remedy and for “hangovers”. A decoction of leaves and flowers made in wine, helps congeal blood from bruises. Helps heal wounds, treats sores, ulcers, gangrene, mouth sores, bleeding gums, helps heal broken bones, insomnia (use the syrup of this herb for insomnia, 2 tbsp. upon retiring). Prepare an infusion from the leaves and sweeten with honey. This herb is a narcotic. Take at short intervals only and then under medical supervision.